Today is an especially, especially special Tuesday. Tuesdays are always especially special, thanks to my weekly baking club, Tuesdays with Dorie. This week we've made tartest lemon pie, which is very much like a lemon bar in pie form with the added economy of using every bit of that lovely citrus fruit. (Except for that little green Sunkist tattoo that I sliced off.) Pucker up for yummy and click over here for the recipe. But what makes today especially, especially special is that I'm reviewing a book that I thoroughly enjoyed and found myself unable to put down. 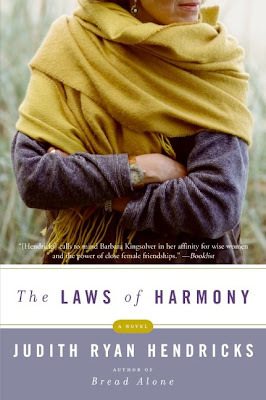 A few weeks ago, I received a copy of The Laws of Harmony by Judith Ryan Hendricks. It's one of those books that when you read the first page, you feel that you've gained access into a fully developed story. I think women authors are particularly adept at this thorough immersion. (Think Anne Tyler and Kate Jacobs.) This is the kind of story that is thoroughly engaging because of its richness of simple truths about perception, reality, self-discovery and acceptance. Thirty-something Sunny Cooper seems like she is on the verge of having the recipe for life come out just perfect: a gorgeous fiance, supportive best friend, success in her career, and a buttery Spanish pie in the oven to boot. But she can't ditch that sinking feeling that everything that seems perfect might actually be out of harmony. The rapid unraveling of Sunny's life creates a mysterious plotline full of suspense and intrigue, but more importantly, an immediate need for Sunny to finally understand what getting it together is really all about. Like all great books, you won't want to put this one down until you see Sunny through her journey. And when you finish, you'll wish you had a sequel right next to you. Hendricks is one of those authors that has one foot in the library and the other in the bakery; her book is as crammed full of delectable writing as it is with luscious food descriptions, so please don't read hungry or you very soon will be tempted to nibble at the salty pages. Hendricks understands the symbolic nature of food-the preparing, the eating, the sharing, the serving. Sunny's gobbling of "giant, still warm chocolate chip cookies: with "caramelized edges and gooey chunks of chocolate" underscore the importance of cozy belonging, mothering, and home. You'll be ravenous when you're done reading, not just for Judith's food, but also for her other books. I've already ordered her other bestseller Bread Alone. This time I'll arm myself with something extravagently delicious before I dig in and read. Click on over to learn more about Judith Hendricks or to get your own copy of The Laws of Harmony. P.S. I still haven't forgotten those jelly donuts, but after scouting recipes that call for 2/3 a cup of butter(!!!) for the dough that is eventually going to be fried, I'm waiting till I have loads of company to split up the indulgence. That should happen next weekend. Am I blind? I cannot seem to view the recipe on the link...Do you have to have the book? Sorry-it's not you. I'll fix the link as soon as I can find the recipe. If not, I'll send it to you. Oh - how yummy! And that books sounds wonderful. I am always on the lookout for a good book. Thanks Prudy! Yummy! I love lemon pies!! Hi! I'm so glad you enjoyed the book! I'm a fan of your blog and recommended you to Lisa from TLC booktours - I hosted at my blog last week. Cheers! I love lemon tarts and yours looks really great Prudy. I love lemon desserts! Perfect for this time of year too! The pie looks delicious! Is it in any related to your lemon cupcakes taht Mom has been raving about? That book sounds great and I would love to read it with a delicious batch of chocolate chip cookies! And I hope I'm around to share in 2/3 cup butter jelly doughnuts! The tart looks wonderful and I love the idea of using the whole lemon!!! GREAT tartest tart. I thought they were better than lemon bars, like black tie lemon bars. Looks great! I love that you are a food blogger AND a book blogger all in one. The pie looks good. I love lemon bars...in a pie!